Home > Ads and Magazine Articles > Toys, Figures, Crayons, Magic Tricks, Sea Monkeys > 1959 Ad 3 Big Map Puzzles by Bilt-Rite Toys Lafayette, Ind. 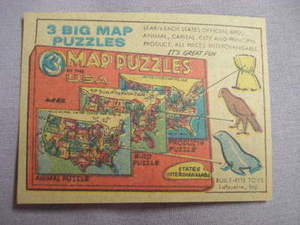 This is an original trimmed 3 1/8"x2 1/2" 1959 color illustrated ad from a comic book for "3 Big Map Puzzle"s by Bilt-Rite Toys Lafayette, Ind. "Learn each state's official bird, animal, capital city, and principal product. All pieces interchangable. It's great fun."